Banana 5 Cubic Zirconia Butterfly 14g / 10mm-Lg / 5mm Ball . The jewerly is 14 gauge with a 5 mm ball. 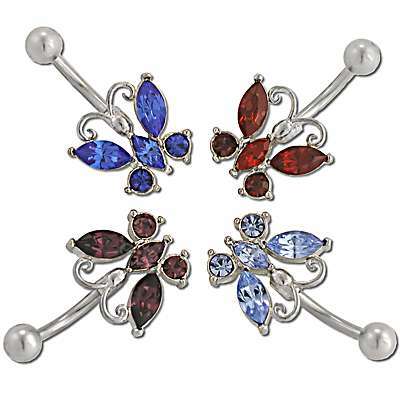 There are 4 different CZ colors available- Aqua Blue, Blue, Pink Rose and Amethyst. The order will be packed in these assorted colors. If you require specific colors please contact us and we will do are best to meet your requirement. Please note: To prevent transmission of disease and to address the health concerns of our customers, we do not accept returns on body jewelry.